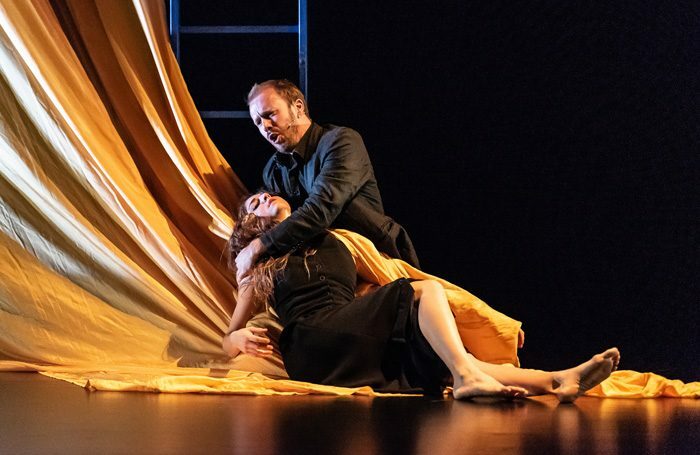 Pascal Dusapin’s Passion, a meditation on the Orpheus myth, was premiered 10 years ago at the Aix-en-Provence Festival, but this collaboration between Music Theatre Wales, National Dance Company Wales and the London Sinfonietta is its first UK production. After Basingstoke it tours to London, Cardiff, Snape, Salford and Mold. With directing duties shared between an opera specialist (Michael McCarthy) and a choreographer (Caroline Finn), it is billed as an opera-ballet. Two solo singers (simply Him and Her in Amanda Holden’s translation of the original Italian text) share the stage and sometimes engage physically with six black-clad dancers. Six further performers, the vocal ensemble EXAUDI, sing offstage. The black-box decor is adorned only by a floaty imperial yellow curtain and a blue ladder rising into the flies. Passion is less a drama than an evocation of moods and emotions. While the tone is predominantly elegiac, gestures occasionally signal extreme distress. The generically poetic words, at least amidst the ravishing sonic blend produced by the Anvil’s bell-like acoustic, can be hard to decipher. There are no doubts about the exquisite quality of the score or the meticulousness and intensity of the musical performance under Geoffrey Paterson. Dusapin’s swathes of sound, sometimes overlapping, sometimes almost pointillist, remain translucent and coherent, never sinking into indulgence. He complements conventional orchestral instruments with judicious use of an oud, a synthesizer, electronic noise and, to melancholy effect, a lonely harpsichord. Johnny Herford’s supple high baritone evokes shades of Debussy’s Pelleas, while, Jennifer France, in a role written for Barbara Hannigan, soars and swoops like a swallow on the wing.